I’m still working through the Fäviken cookbook, and armed with the weekend’s forage of autumn leaves in various stages of maturity tonight seemed like a good moment to try the ‘Broth of autumn leaves’ (p190). I wasn’t convinced that I had exactly the right moss (or the perfect leaves), but I was confident that they were edible – at least in the sense that they wouldn’t poison me. I don’t have a steam oven, but I decided to improvise with a large pan of boiling water in the bottom of my existing electric fan oven. Overall, I felt a certain healthy scepticism about the likely outcome. 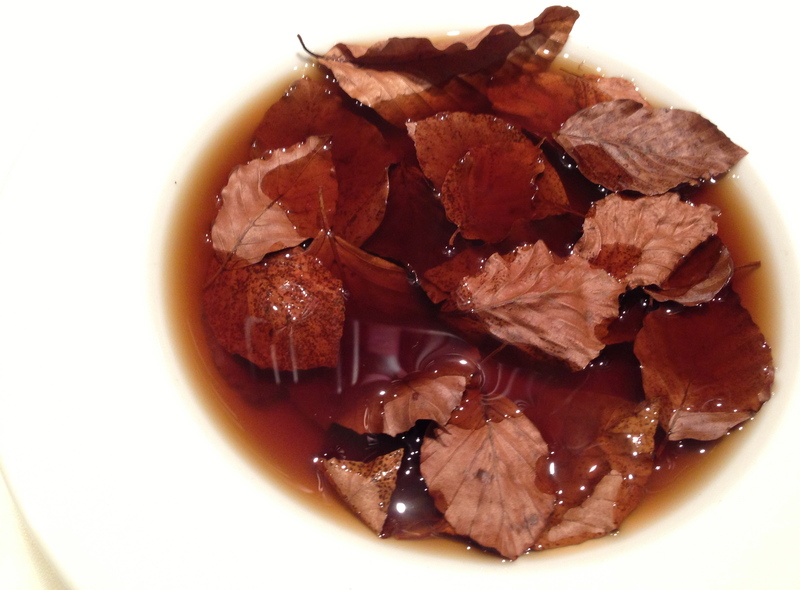 It seemed like a lot of fuss for what would probably, despite the introduction evoking the true spirit of autumn, turn out to be a mushroom consommé with a bit of fancy presentation. But how wrong I was! This was the most surprising, delightful thing I have tasted in a long time. I can’t wait to make it again for some friends. In his headnote Magnus Nilsson suggests eliminating salt, or at least reducing the quantity so as not to over-emphasise the mushroom flavour of the broth. It might be because, against instructions, I used some dried mushrooms (adhering to his principles of using what is available and what you can forage – they were mushrooms I’d collected and dried myself) but I found the mushroom flavour more pronounced without salt. As soon as I added salt to a spoonful there was a burst of earthiness on my tongue and I was enveloped by the hummusy presence of the woodland floor. Any hint of mushroom was sent into the background. 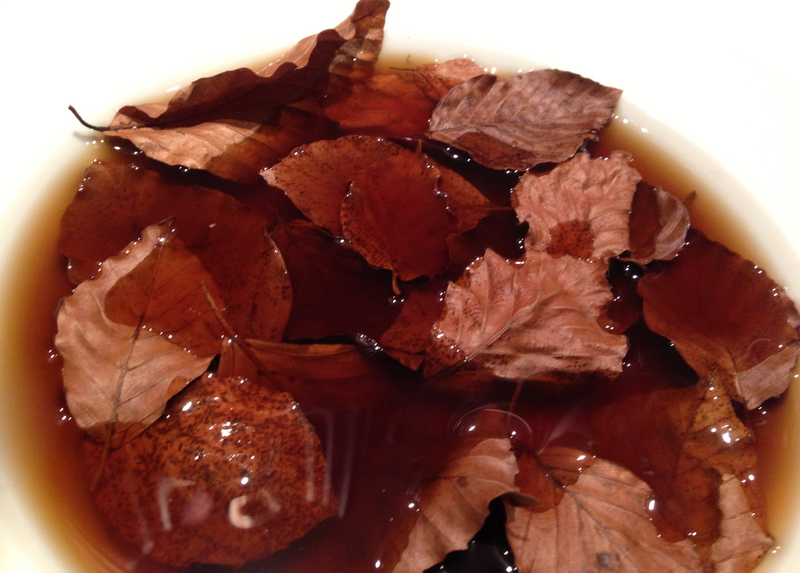 I had been expecting something like a pu’er tea, which I always find reminiscent of a walk through an autumn forest, but this had many other dimensions: it may be a clear broth, but it feels a lot more like food than a cup of tea. I have one small gripe – the measurements are eccentric for a domestic cookbook. Although I understand that professionals and others might work this way, I find it a bit odd to be asked to measure mushrooms by volume and water by weight. But it doesn’t matter. The recipe works, and I haven’t been more excited about a truly new idea and its flavour and presentation possibilities for ages. Can’t wait to try some more. Plus, I’ve just noticed, there is a similar broth served with a fish and langoustine dish (p126). Wow. from Nilsson, Magnus. Fäviken. London: Phaidon Press Ltd, 2012, p190. The original serves 6; I halved the quantities so this version will make a light starter for 3, or you could of course double the recipe up again. 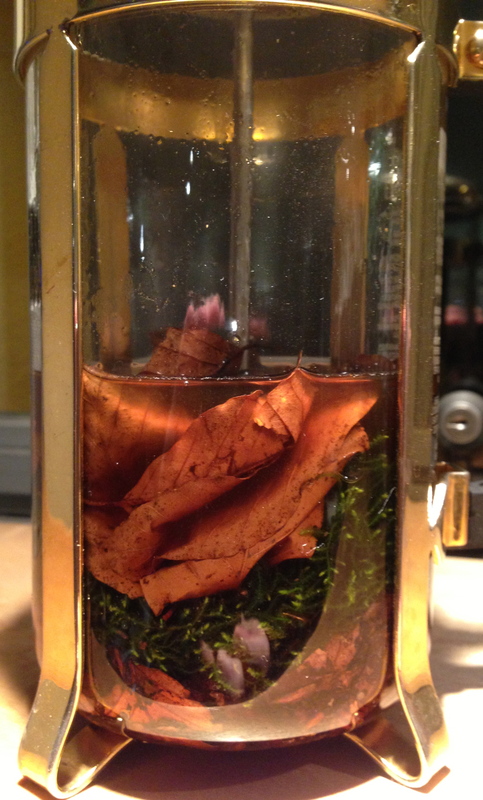 Meanwhile, put the moss, the old leaves and 1½ handfuls of the fresh ones in a glass teapot [or coffee pot – it’s nice to be able to see what is happening, so anything that is clear and heatproof will work]. 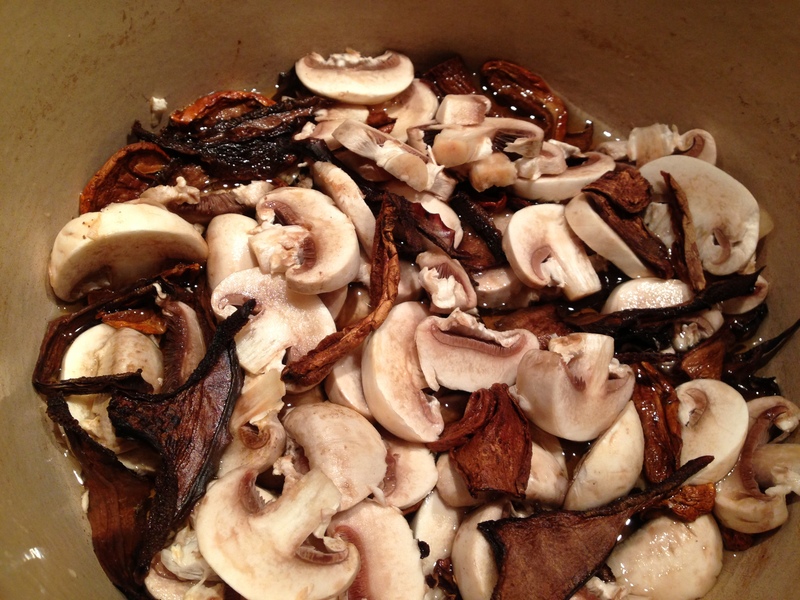 Remove the container of mushrooms from the oven and open it carefully. Adjust the salt if you wish, and immediately strain the hot liquid over the contents of the pot and leave to infuse for about 3 minutes. Arrange some fresh autumn leaves in soup bowls, and pour the hot aromatic broth over them, preferably in front of the diner. Note on leaves: the book advises that you should collect leaves that are already clean. For this year’s leaves, you need to gather the top layer of the leaf covering on the woodland floor; for last year’s, the layer below, which is starting to break down but has not yet quite turned into soil. 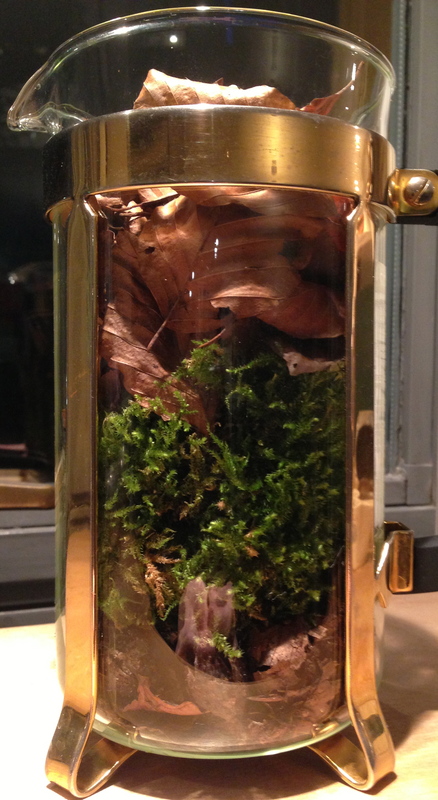 Note on using foraged ingredients: It is entirely your own responsibility to decide which leaves, mosses or other natural products to collect; whether they are clean and edible; whether it is a good idea to use them in cookery; and whether to cook them or serve them to others.